The ‘Doors of India’ campaign, by Tata Steel Pravesh Doors, documents the rich heritage of doors in India. 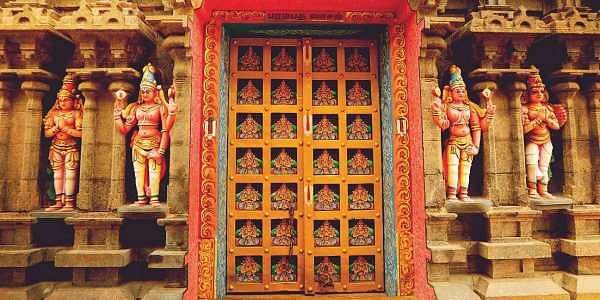 CHENNAI: Have you ever felt awed while crossing the threshold of a temple, looking up at the intricately carved several-feet-high door? India’s traditional architecture was handcrafted so delicately and thoroughly that it captured even the tiniest details, from towering sculptured gopurams to intricately carved door handles. To document this rich heritage of doors, Tata Steel Pravesh Doors has started a pan-India campaign, along with JWT Kolkata and Hungama Digital Services (HDS). The campaign is spread across six zones, and Divyakshi Gupta, a Mumbai-based travel blogger with a decade’s experience, is curating the project, mapping the routes and selecting the doors for the campaign. Her tryst with doors started way before this project — her Instagram handle is filled with stunning doors from across the country. She was even the first Indian travel blogger to be featured in Wordpress, owing to her passion for doors. “I have always been fascinated by doors as a photography subject. I always felt there was something more to a door than a pretty frame. I romanticise the whole aspect of the door and personify it,” she says. The South-East zone was covered by Divyakshi, who uncovered the doors of temples, palaces and mansions in Kanchipuram, Pondicherry, Tiruchy, Madurai, Chettinad (Karaikudi) and Ambasamudram near Tirunelveli. The 1,500-km journey, shooting and travelling daily lasted about eight days. “A typical day could begin at 4 am. It would involve travelling to the location, setting up the shoot and then go on till the light goes down,” recalls Divyakshi. The videos bring out the history of the door, materials used to build and carve it, and the story behind it, along with Divyakshi’s narration which brings the door to life. “The door at Ekambareshwarar Temple, Kanchipuram, is a guardian of Dravidian architecture. The door at Varadharaja Perumal Temple, Kanchipuram, was a giant spectator of devotion, seeing so many faces of the faithful devotees, and so on,” she revers. Among all the doors she visited in this tour in South India, which is her favourite? “Without doubt, the door in Ranganathaswamy temple in Tiruchy. It is known as the swargha vaasal, or the doorway to heaven. It is not just a pretty frame, but there is so much faith around it. It opens only on the Vaikunta Ekadeshi day, and it is believed whoever crossed through it that day attains salvation. I believe that prayer is the key to heaven, but faith unlocks the door,” she explains reverently, adding that this door was mentioned in the list of ‘The prettiest doors in Asia’ by CN Traveller magazine in 2016. Being a non-Tamilian, how did she manage traversing temple towns? “Many people in Tamil Nadu do understand English. There were places where I had to converse with smiles, courtesy a few Tamil phrases including, romba nandri, seri etc,” she laughs, expressing gratitude to Krishna, the driver who was extremely helpful. “Many were amused to find a Punjabi documenting the state, but to me architecture, heritage. and doors have no language barrier,” she smiles.